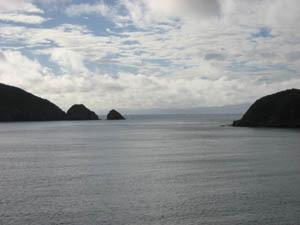 For my journey With Holly Farm to the North Island for Nationals, our goal was to pack and get gone by noon, which wasn't going to happen, so, at the latest by dark, because we would catch the 7:00 AM ferry. 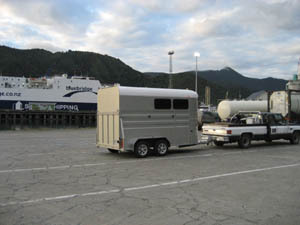 We'd be taking 2 trailers for 4 horses; 3 would be ridden at Nationals, and we had a bred mare to haul back home to Auckland. David and Sandie sure hoped they'd get someone to haul her up north with them after Nationals, so they wouldn't have to spend another 16 hours or so driving her. Me, I'd volunteer to stay at ridecamp and watch the ride horses! Nobody was panicking about packing or getting ready, and there was a lot to do: pack gear, clothing, food; clip the ride horses (they got show clips around the head); get things situated on the farm since they'd be gone for about 10 days. They'd either have a person staying there or coming to feed and check on all the animals. Meanwhile, there were horses' feet to trim, horses to move to different paddocks, a demonstration of driving for a gal that would work with a few young ones, and a few more stallions to show me, Zaddam and Simeon Sapar and Imperial Makkir. Dahman Vanzant finished the Horse of the Year ride, but vetted out at the finish - his heartrate didn't come down. That's the first time that has happened with him. Sandie's doing the 160 km on him at Nationals. It will be his and her first 160 km. He's a homebred by Simeon Sapar. David will be riding Zaandel in the 100 km. He qualified last year as a 5-year-old, and was 3rd and got BC in the North Island Championships 100 km. This will be David's first ride back 2 years after breaking his pelvis. Sandie will also ride Mateus in the 100 km ride. Now that's endurance - ride a hundred miles starting Saturday at 1 AM, then get back on another horse and ride 65 miles starting Sunday at 1 AM! Mateus finished the Horse of the Year ride with a young South African girl aboard. Mateus is a character, rather pushy and annoying on the ground (but nice to ride, says Sandie), but you can't help but like him. He ate half my veggie sandwich the other day and he knows when I have candies in my pocket and he insists on sharing them with me. And a note about New Zealand endurance: New Zealand about 10 years ago voted to go the way of FEI. They follow FEI rules for all their official rides. Horses and riders must first ride as novices, and complete 2 40 km rides, then 2 80 km rides, before they qualify as Open riders and horses. Most of the 120 km and 160 km rides begin around midnight and get the hardest loops out of the way first, in the dark, when it's cooler. This CEI*** 160 km starts at 1 AM; the CEI*** Junior-Youth 120 km starts at 4 AM. This year's Nationals is a big shindig: there's not only the 160 km and 120 km, there's also a CEI** 100 km Sunday at 4 AM, an 80 km Junior ride Sunday at 6 AM (and Juniors here do not ride with sponsors), and the National Championships for Competitive Trail Riding, a 70 km Open, 40 km Intermediate, and 40 km Junior ride, beginning at 7 AM on Saturday. It's going to be busy! We drove on into the night, with one stop for gas and burgers, talking horses. I wasn't sleepy, but I laid down in the back seat of the GMC, and was just drifting off when David said "Are you asleep?" I blinked awake. "Uh - no." "Well, I'm getting pretty sleepy... you want to drive?" ACK! "Uh sure." Here I am, half awake at midnite or so, not only driving on the left side of the road, but pulling a horse trailer and 2 horses! And I by choice don't do a great deal of hauling at home in the States. ACK! While the Eagles were singing "Desperado, why don't you come to your senses," I was singing "Retardo, why don't you stay on the LEFT SIDE OF THE ROAD!!" Gauche! Gauche! Careful! Horses in back! I asked David just before I pulled out, "Is the road going to get wind-y?" because I was pretty sure this was that same godawful winding road that Linda and I drove on coming down. "No, it shouldn't," and as soon as he passed out, and the road got wind-y! Winding, narrow, with skinny bridges, and of course on every skinny bridge and curviest corner I met a truck! ACK! I was no longer sleepy, let me tell you! A bit of adrenaline kept me wide awake. I drove for half an hour and David woke up refreshed. So I crawled in the back again and dozed off... then at 1:30 AM we turned off the highway onto a dirt road and drove a ways before pulling over. I didn't get up, but saw later they'd set up the wire fence pens for the horses, and were stopping for a few hours' sleep. The moon was glowing brightly through a cloud cover, and you could hear the beach and waves crashing a short distance away. Tired as I was, I never fully fell asleep. At 4 AM we got up and took down the fences and loaded the horses again. We were back on the road at 4:30, headed for the ferry at Picton where we needed to be at 7 AM. I was now pretty tired, and was dozing off, and then David woke me to drive again. ACK! He said to stop at the first open coffee place, which happened to be 15 minutes down the road. All he needed was that power nap, and the coffee, and he was good to go. So, I laid down again to try to sleep, and we pulled over shortly after that, because Sandie was fading. I couldn't believe she'd lasted that long. He went to drive her truck and I drove again, following David, all the way into Picton. Fortunately for me there wasn't a great deal of traffic to worry about. Those roundabouts you have to drive around here, though, I'm not quite sure about in a car, much less a horse trailer. I was really glad it wasn't rush hour! We arrived at the ferry at 7:05, and it was loading already. We had to park behind the loading area, and David went to get the paperwork, and actually ask to get on the ferry, because he hadn't booked! He just hadn't gotten around to booking. They said at first there wasn't any room for us, but we squeezed on, the last few to make it on the ferry. Now, I'd gotten a text from Trevor that the crossing he'd taken I think at 7 PM or so had been great. But, knowing that it was 12 hours later and weather can change quickly, and knowing that I can get seasick in a bathtub, I'd pulled out my seasick pills from Greece and took one. It was a smooth crossing after all, and I stayed awake for the whole thing, most of it on the cold front of the boat. David and Sandie and little Trent had a cabin to sleep in, but I figured I'd sleep in the truck while driving. I didn't want to miss any part of the crossing on the ferry! I had a coffee followed by a cappuchino, and stayed chilly out front till I had to take a break on the warm side of the boat for a while. 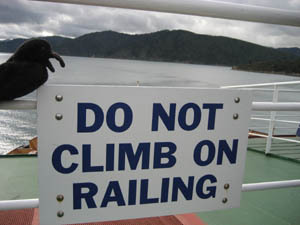 Then I went back up front and stayed there till we docked in Wellington. From Wellington we drove a half hour till we stopped for gas, then another half hour or so till we got to Queen Elizabeth park in Paekakariki on the Kapiti Coast. There about 1 PM we set up the fences and unloaded the horses for a few hours' rest. 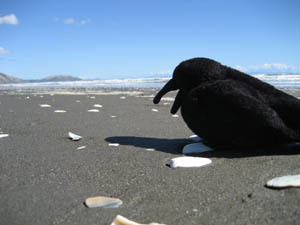 The Raven and I had to go see the beach and touch the Tasman Sea, then went straight back to the back seat of the truck. By then I felt like a chocolate bar left on the hot dash for far too long, and I totally passed out for 2 1/2 hours. Our destination was Rangiwahia, a tiny town in the foothills of the Ruahine Range. This would be basecamp for the Nationals, being put on by the Ruahine riding club. We were planning to be there by dark, but you know how that goes... We got back on the road at 4:30 PM and drove on into dark again, and eventually turned off the main highway 1 onto this seriously hilly winding road for 14 km till we came to Rangiwahia. We couldn't go on the ride grounds till Wednesday, so we went and camped on Butch's farm. Butch is an endurance riding farmer from Rangiwahia. 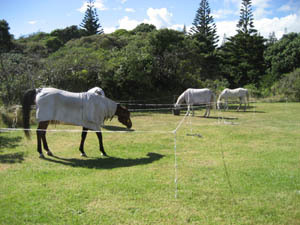 We set up the fences for the horses, got them fed and settled. The full moon (or one day short) was up, and it was silent but for the horses munching. By now I was feeling pretty wrecked, and could think of nothing but crawling into the back seat of the truck for bed, and David said we'd go to Gary and Vicky's. ARGH! Sandie said she'd stay with the horses and sleep, but even though I was about to fall asleep on my feet, I went along with David and Trent. Really, you can't pass up a chance to visit people in New Zealand. And anyway, my bed was our vehicle! So we drove a ways to Gary and Vicki's and got to their place at 9:30, and they were a bit surprised to see us. Not displeased, just surprised we'd shown up so late. They gave us coffee, and talked horses. Gary's the president of the Ruahine riding club that's putting on the ride. We got back to the farm about 11:30 PM and I passed out. And that was the end of our 24+ hour Epic Journey back to the North Island.